Hormel Foods Corp. CEO Jim Snee said he couldn’t be more proud of his employees and the way the company performed in 2017. 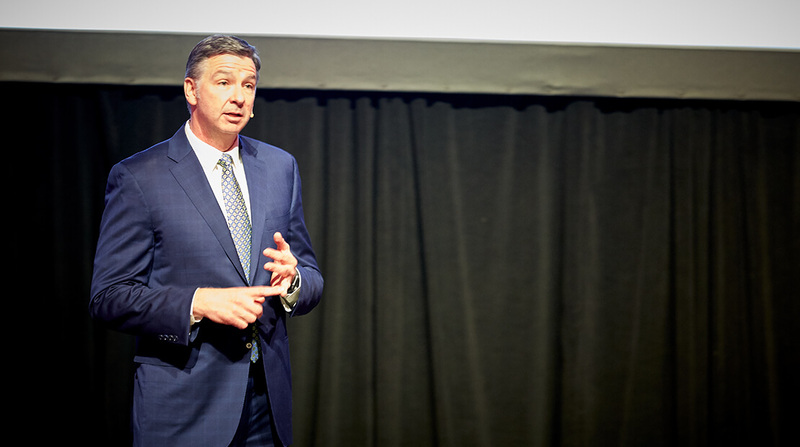 “Hormel Foods isn’t just any company,” Snee told shareholders during their annual meeting at Austin High School on Tuesday. “We are one of the most successful food companies in the world” thanks to employees who work hard, have vision and challenge the status quo. “Inspired people creating inspired foods” continues to be a resonating mantra for the company. Many of those employees and retired workers came to the meeting; both Knowlton Auditorium and Ove Bergen gym held overflow crowds. There was lots to talk about. In a talk entitled “The Path Forward,” Snee said that 2017 marked the second-most profitable year for the company, with three of its five segments enjoying record earnings and sales growth. Grocery products had “a banner year,” said Snee, and was led by Wholly Guacamole dips, Spam. and Herdez salsas. An ever-expanding refrigerated foods segment is working with restaurants, hospitals and other institutions and is finding a growing market for the company’s pre-sliced and pre-cooked foods. And, the company continues to expand its international footprint, he said.